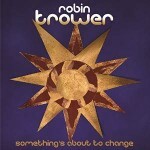 Share the post "Album review: ROBIN TROWER – Something’s About To Change"
‘Something’s About To Change’ is almost a contrary title for an album cemented in Robin Trower’s unchanging world of brooding grooves, deep tones and whispered, world weary vocals. It’s a unique combination given extra depth by heartfelt songs, a lightness of touch and his deep tones, timbre and textures, as evidenced by delicate tracks such as ‘Fallen’ and the atmospheric ‘Dreams That Shone Like Diamonds’. The latter track adds poetic lyrics to the kind of ethereal guitar work that he first explored on Procol’s ‘Song for a Dreamer’. You could argue his essential DNA imprint was always been there of course, before he became enthralled by Hendrix and headed into American stadium based rock. ‘Something’s About To Change’ is almost a repost to that part of his career. It’s the work of a mature artist and a sonic explorer who long ago embraced the blues and indulges himself in a dreamy languor to search out feel, tone and deeply wrought emotion. The dozen tracks on the album flesh out a bigger picture that offers a portal into the interrelationship between Robin’s tone colour and his lyrics. He’s a player’s player, who has the ability to bring something special to a standard slow blues such as ‘Good Morning Midnight’. He does so by making the most of the spaces that the subtle arrangement offers him. His delicate vibrato offers a potent suggestion of myriad possibilities, over a subtly mixed drifting organ and brush stroked percussion. This album makes little concession to anything outside of Robin’s sacrosanct belief in the primacy and expressive ability of his tonal emphasis. The sultry tempos rarely extend beyond the laid back, while the band’s accompaniment is precisely that, creating the framework for Robin to lean into his solo’s in a manner that would surely make Peter Green smile. ‘Something’s About To Change’ also marks the point at which he has finally found his own voice outside of his guitar playing. In the past his vocals were at best passable, whereas on this album his phrasing hovers gently over slowly evolving weighty grooves. Each composition reveals different layers incrementally, in the manner you might expect from an expressionist painter applying thick and deliberate brush strokes. And in the absence of a defining solo, Trower frequently lets a note vibrate and fill the room before it slowly descends to draw the listener in sequentially. The power riff trio and explosive solo’s have long been laid to bed and replaced by slowly evolving textures that wrap their way round you and lodge in your subconscious. However, there is a brief career flashback on the slightly more up tempo ‘Riff no.7 (still alive)’, as he reaches back to his riff driven hey-day. You suspect he’s happiest on mid-tempo numbers such as ‘Strange Love’, an unremarkable track given real presence by that same combination of confessional lyrics, hoarse vocals and a subtle guitar part that again draws the listener in. This entry was posted in ALBUM REVIEWS, ALBUM REVIEWS (Mobile), All Posts and tagged album, blues, funk, guitar, interview, Jimi Hendrix, Peter Green, Procol Harum, review, Robin Trower, rock, Something's About To Change. Bookmark the permalink.